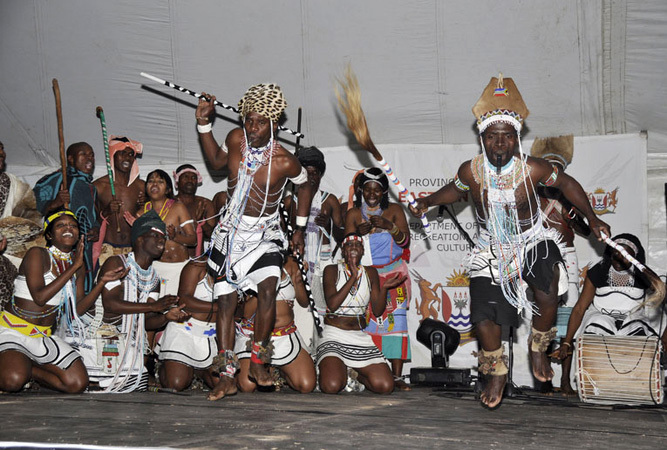 Grahamstown is renowned as Festival City, as it is host to the largest arts festival in Africa – the National Arts Festival. Most people visit the town during the festival period, and experience the crazy bustle of thousands of tourists jostling their way down High Street, dodging between the hawkers touting their African wares, and on to the next fantastic show. 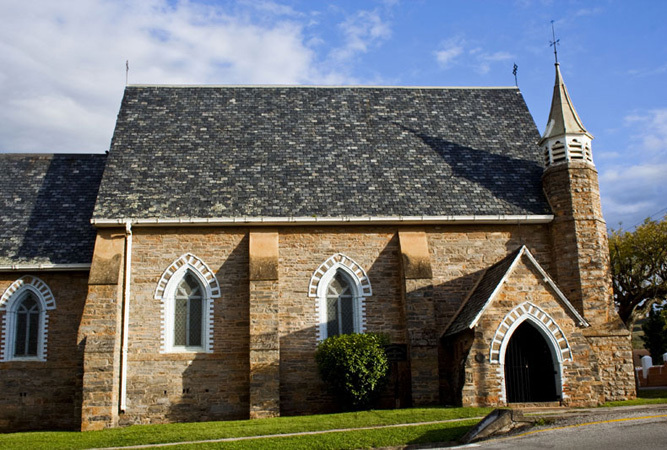 Grahamstown is not just known as the festival city, it is also known as the “city of saints,” partly due to its many churches. However the story goes that it’s got its moniker because in the 19th centaury some engineers sent away for a vice, and were told by their superiors to buy the vice in Grahamstown. They replied “there is no vice in Grahamstown,” and the legend was born. 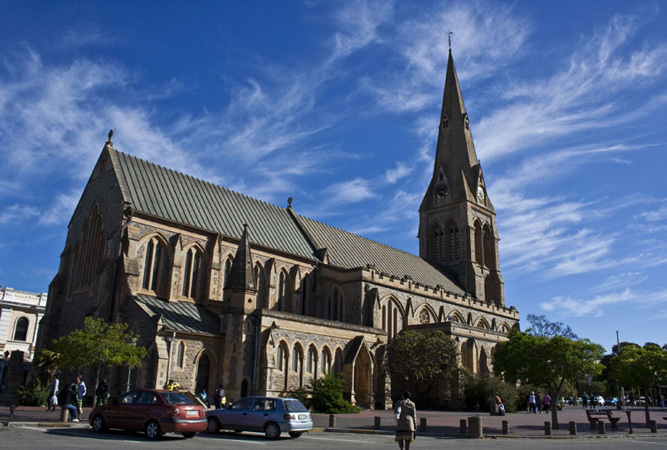 The centre of the town is dominated by the cathedral of St Michael and St George, which has the tallest steeple in South Africa. The cathedral has beautiful stained glass and is open during the day till about three and is well worth a visit. This is not the only church, there are many little churches dotted around, from the St Andrews Chapel to the Methodists and Presbyterians there are over 140 to choose from. 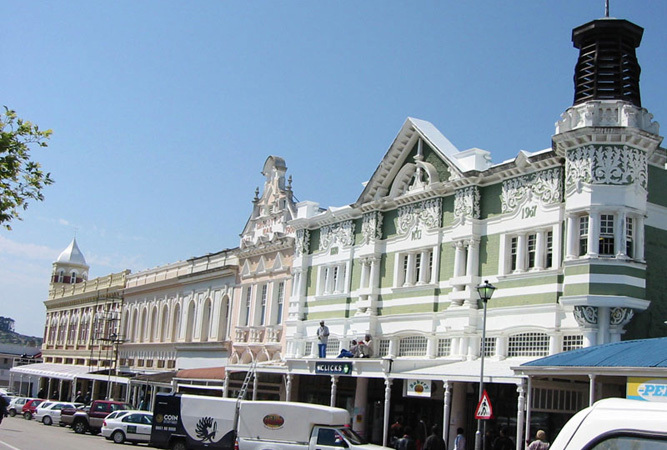 The town has some of the best preserved Victorian architecture in South Africa, and High Street has many beautifully preserved facades. The Observatory museum is well worth a visit to see the Victorian history of the town. The building houses the Observatory which has a fascinating Victorian Camera Obscura, – be sure to go on a sunny day for a fantastic view of the town – a great way to spy on the town! 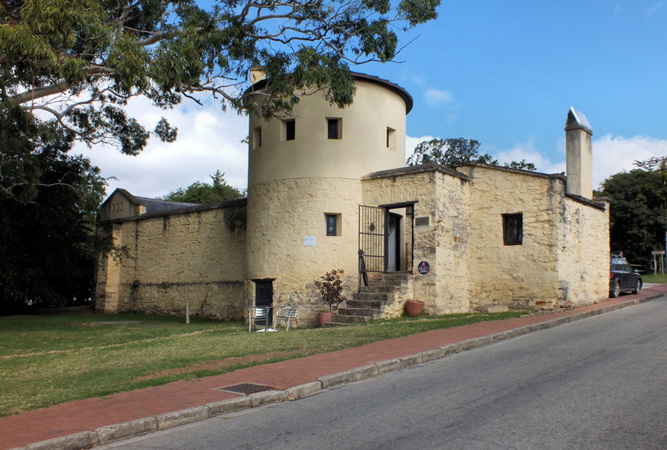 There are many stories, battles and events that have taken place in Grahamstown, and if you are lucky enough to stay at no 7 Worcester street, your host Alan Weyer will be happy to take you on a “Spirits of the Past” tour, a fascinating historical journey from the battle of Makana, to the numerous ghosts and haunted spots in the town. No 7 Worcester is rather up market accommodation, but as there is a huge influx of tourists over the National Arts Festival, there are many Bed and Breakfasts and self catering options dotted around the town which range in price. The town is small and you can easily walk everywhere, as many students do! There is not much in the way of public transport, but the town is generally safe, and many people get by just walking from place to place. There are several places where guests can dine out – try the Yellow House for delicious cocktails and pizza. This is a favorite student hangout, and there is often a fantastic atmosphere. A historic spot for many Rhodes students is the Rat and Parrot, a lovely pub that serves delicious meals, including butternut ravioli which was divine. Dine early before the partying gets underway. The town may not be big on clubs and shopping malls, but if you are looking for a quiet Eastern Cape getaway, Grahamstown’s warm hospitality and welcoming community are perfect for a stop over on your way to one of the fantastic game reserves in the area. Spend a day delving into the fascinating history of this quiet town and marvel at its many beautiful churches.